At Historic New England, we strive to be a model of preservation excellence. This means sharing expertise with the next generation of practitioners at programs such as our annual Field School in Preservation Philosophy and Practice. This weekend-long event connects Historic New England’s property care and preservation services staff with students, professionals, and advocates in the preservation field. In alternate years, the Field Schools focus on how we preserve our publicly accessible museum properties and the privately owned properties that are part of the Preservation Easement Program. 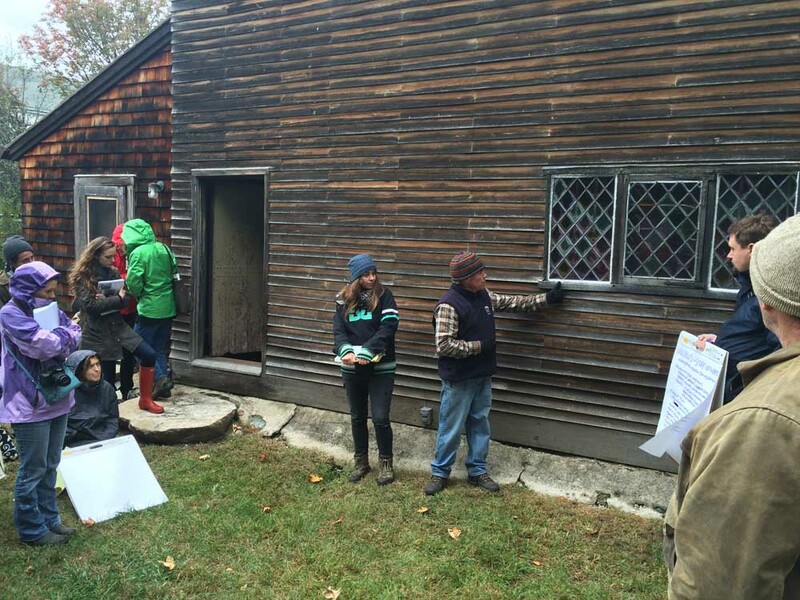 From October 2 to 4, this year’s Field School centered on Historic New England museum properties. Twenty-three participants, including students from six regional historic preservation graduate programs as well as architects, facilities managers, and avocational preservationists, gathered at Browne House in Watertown, Massachusetts. In group exercises there and at the Codman Estate in nearby Lincoln, Field School students worked with property care staff to perform conditions assessments, identify treatment options, and develop scopes of work to address repair needs, applying the tenets of Historic New England’s research-oriented Preservation Philosophy. Close observation skills were tested at Browne House (c. 1698), where Historic New England founder William Sumner Appleton undertook in 1919 what is acknowledged to be the first fully documented restoration in America. Above, a group explains their scope of work to treat a reproduction leaded casement sash, whose frame replicated an original frame Appleton uncovered in the Browne House walls. Next year’s Field School will focus on the innovative Preservation Easement Program, a national model for preserving privately owned properties at the high standards our museum properties enjoy. Both Field Schools give the public unique access and insight into how Historic New England achieves excellence in protecting heritage buildings and landscapes.